The Band Perry recently paid a trip to their birth state of Mississippi to visit with service men, women and their families at Kessler Air Force Base before performing in Biloxi at the 20th Annual Mississippi Coast Coliseum Crawfish Music Festival. Mississippi Governor Phil Bryant and First Lady Deborah Bryant greeted the siblings with a private brunch at the Governor’s Mansion on Mon., April 23, the same day the group was celebrated with a resolution commemorating its career success and accomplishments. The presentation was held in the Mississippi State Senate Chamber, introduced by Senator Michael Watson and was passed by both the House and the Senate. 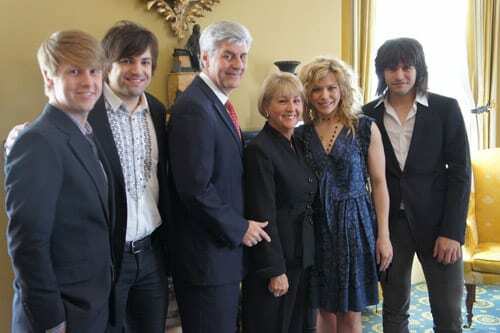 The Band Perry’s received another accolade later that afternoon, when news was released of the group’s CMT Music Award nomination for Group Video of the Year. The Band Perry then headed to New Orleans to shoot the music video for “Postcard From Paris,” the fifth single from the Platinum-certified The Band Perry (Republic Nashville). The group has also resumed opening duties on Brad Paisley’s Virtual Reality World Tour in addition to headlining individual dates.